On August 2, 1799, Father Mariano Gomez, one of the triumvirate priests known in Philippine history as GOMBURZA, was born in Sta. Cruz, Manila. GOMBURZA is an acronym of the surnames of priests Mariano Gomez, Jose Apolonio Burgos, and Jacinto Zamora, who were executed on February 17, 1872 at Bagumbayan (Luneta) by Spanish colonial authorities on charges of subversion arising from the 1872 Cavite mutiny. 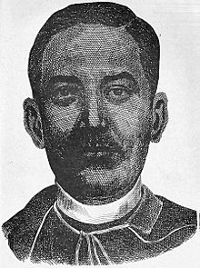 Gomez, then aged 25, and designated head priest of Bacoor, Cavite, fought for the Filipino priests' rights against abuses, getting the ire of Spanish friars who eventually ordered his arrest and incarceration. He was thrown in jail along with Fr. Burgos, Fr. Zamora, Joaquin Pardo de Tavera and Maximo Paterno. The priests' subsequent deaths sparked the Philippine revolution. Before he was executed, Fr. Gomez published the newspaper "La Verdad", or the Truth. The paper served as the voice of the Filipino propagandists against the Spanish colonizers.